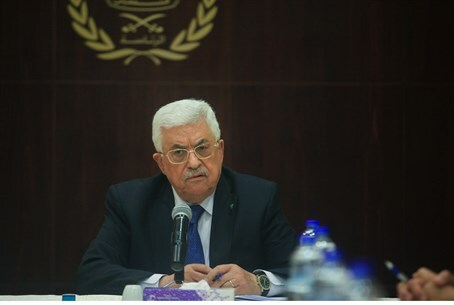 PA and Fatah leader Mahmoud Abbas says unity government with Hamas will likely dissolve in the coming days. Palestinian Authority (PA) leader Mahmoud Abbas has threatened too dissolve the Fatah-Hamas unity government within 24 hours, as an ongoing dispute between his Fatah party and Gaza's Islamist rulers boils over. "The government will resign in the next 24 hours because this one is weak and there is no chance that Hamas will allow it to work in Gaza," Amin Maqbul, secretary general Fatah's Revolutionary Council, said in Ramallah Tuesday, following a meeting of the Council in which Abbas made his threat. The two rival factions signed a reconciliation deal last year, and declared they would be forming a unity government - to the anger of the Israeli government, which cited it as proof that Abbas could not possibly be interested in peace with Israel if he was joining a government with a terrorist group sworn to the Jewish state's annihilation. But since the deal was signed the "unity government" has been dysfunctional at best and essentially non-existent at worst, amid mutual recriminations. One of the most bitter points of contention has been the issue of government salaries in Gaza. Hamas administration officials say they are not being paid the salaries due to them for running day-to-day governance in Gaza, while Fatah members are being handed wages despite not actually doing anything at all. In one incident last April, a major delegation from the unity government was forced to leave Gaza just one day into a scheduled week-long trip, when Gaza's Hamas rulers - who were technically meant to step down in favor of the unity government - accused them of being biased towards Fatah. The rivalry between the secular Arab nationalist Fatah and Islamist Hamas exploded in 2007, when the latter, having won a majority of the votes in 2006 elections (Gaza's first, and last democratic poll), carried out a bloody and violent purge of Fatah officials and fighters in the coastal enclave. Speaking to AFP, Maqbul said discussions to form a new government would begin immediately after the current one steps down - but he didn't say whether that new administration would be coordinated with Hamas. "After the government resigns, we will start consultations to form a new government," he said. Speaking on condition of anonymity, another PA official told the news agency the unity government's dissolution was the result of its "inability to act in Gaza," and that the decision had been mulled for some time in advance. "There have been discussions inside the government about resigning if they are unable to do anything for Gaza," he told AFP.